Possessing a delicate, tactile sensitivity in her music that resonates with her twisting, intricate and miniature sculptures such as Portraits in Wire (2014), Eleanor’s musical practice has explored relationships located at the interface between instrumental surface and human skin. In particular, three piano works from 2014 – everything located on the surface-skin, movements in two positions, and often empty on the insides – exemplify this strand of compositional thought. These works make use of material and physical constraints to derive musical structures, forms and choreographic micro-gestures that alter a musician’s appreciation of tactility in performance. For a detailed account of these pieces and evidence of the artist’s attraction to the sculptural arts, I recommend this recently published article by Eleanor in the 5th edition of the CeReNeM Journal. Emerging out of this initial investigation of the surface/skin interface comes Fixations (2014) – a collection of miniatures exploring the cross-pollination of physical gestures associated with one instrumental family with another instrument family. There are seven ‘fixations’ in total and each one requires the player to apply the posture and positions of one instrument onto another instrument of a different family. The performer performs a suggested and singular gesture upon an instrument of their choice and puts down the instrument to finish the fixation. Each fixation last no longer than one minute. Fixations extends the previously constrained physicality of her piano pieces and introduces aspects of sonic imagination and deterritorialization, themes that continue to resonate throughout her work. Both Private Sculpture Series #1-6 (2014) and I, as mouth (2015) are example of these themes made manifest. Private Sculpture Series took place on the fringes of the Huddersfield Contemporary Music Festival in 2014, with a collection of small placard that with a few words of materials ignite the imagination of their reader and, due to their physical proximity to the festival’s concert venues, subtly dialogue with socially constructed ideas of listening. The translocation of physicality in her work takes a more poetic form in I, as mouth for vocalist and percussionist. Here, intimate and sometimes barely audible murmurings on the topic of the mouth recited by the vocalist are sent through vibration transducers that the percussionist controls and activates by coming into contact with the surfaces of resonant objects. Having remained elusive so far regarding the exact details of her contribution to the upcoming Weisslich concert, instead of providing potential Weisslich concert-goers with an account of what to expect from Eleanor on the upcoming concert, I would like to finish this short feature by offering a brief speculation into one direction that I think this work along with her most recent work in the visual field may point towards: a vanishing point. 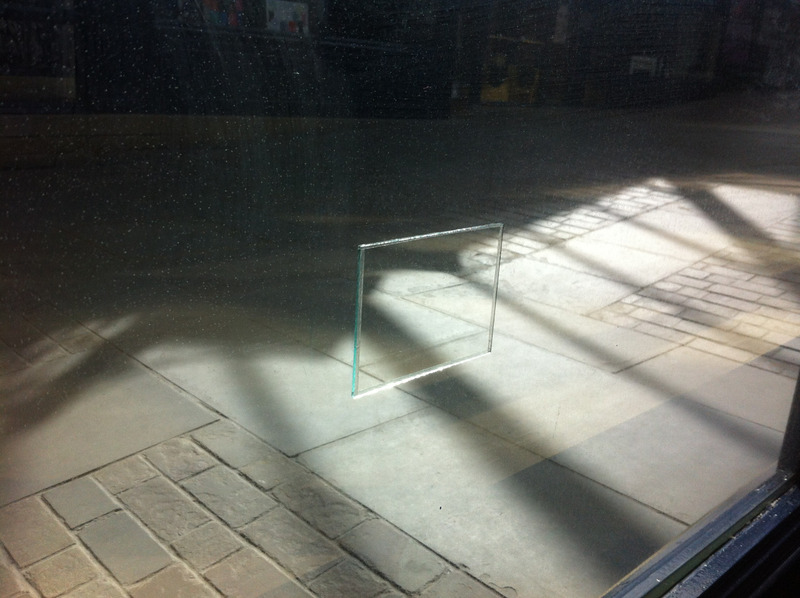 With Itself from 2015 consists of only a tiny glass pane placed overtop a larger window pane. It is an unimposing piece that when, and if, noticed stirs up a perceptual double-take. Seeming to me to be a development of the miniature placards in Private Sculpture Series, With Itself fits along a trajectory of work situated at physical and perceptual fringes. This is work that could be read as being part of a larger process of becoming barely-present or nearly-absent. Like worn traces of a shadow long absent, the artist and their material are disappearing.